Wow, 2016 just flew by! We are now at the cusp of a brand new year, and what better way to celebrate than by reading a picture book? 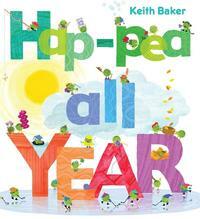 Our selection for this month's Picture Book Highlights, a series of posts where we put the spotlight on a brand-new picture book that has been ordered for all agencies, is Hap-pea All Year by Keith Baker. This is not the first time we meet Baker’s happy green peas—they were first introduced in the alphabet book LMNO Peas, and gone on to teach us about numbers and colors. Now these charming characters are back to celebrate every month of the year through the passing seasons. In each double-page spread, one little pea holds up a sign, indicating the number of the month. There’s plenty to see and kids will enjoy pouring over the pages to find little green peas engaging in all sorts of activities and play connected to each moth of the year..
Get ready for an exciting 2017 – visit your neighborhood library to find this book and more!